"I build a lighted house, and therein dwell." For Inspiring Audio version of the previous paragraphs,click here. Traditionally the zodiac is described as the imaginary path of the sun through the heavens. This path "exists" only from our earth's perspective. If you were observing the path of our sunfrom another planet or body in space, our sun would appear to "be traveling through" different constellations at different times of the year, to be on an entirely different path through the heavens. This path is largely an illusion but at the same time the 12 zodiacal constellations do exist as great beings, and the streams of energy which pass and repass, intermingle and interlock throughout space are by no means illusions. They express eternal cosmic relationships. In the constellation Cancer, we find a doorway into incarnation for souls to gain the experience needed for their evolution. All human lives begin here. Indeed, no soul escapes the need to incarnate. In Cancer one is bound to be limited within the form in order to learn from lifes experiences. Ultimately, we must come to the realization life is beyond the form experience ~ we do not belong in the spiritual sense to the form life and eventually we orient ourselves to the life of the spirit, the real everlasting life. The crab protects itself within its hard shell, even carrying this defense with it wherever it goes ... therefore the protection becomes a limitation. The crabs pincers serve as tools as well as protective defenses. These pincers detangle the astral currents of the mass consciousness of humanity. Learning to differentiate between ones own feelings and everybody elses is a major challenge for the extraordinarily sensitive Cancer native. This extremely sensitive side can be a great detriment for those born under the sign of Cancer, resulting in over-reactiveness, and overly-emotional behavior. Incarnation also forges many bonds: of love, obligation, karmic responsibility. The energy of Cancer rules this commonality of the human experience ... all people belong somewhere, to the family unit, or a larger group, experiencing to some degree the sense of belonging we all need to function as human beings. Ruled by the moon, always the mother of form, Cancer also controls the waters and the tides, representing the astral plane, the realm of feelings and emotions. Association with the past and mother are also seen ~ Mother, as doorway into life, mirrors the Cancerian doorway into life for souls. For the unevolved being, Cancer is all about mass consciousness, the instinctual side of human development, and the opposite of group consciousness. The average Cancer native is immersed in the mass experience where instinct rules and the realm of the subconscious mind and collective imagination; an unconscious part of the great whole. Yet at the same time, Cancerians are subject to the urge to lift themselves out of the mass instinctual life and to develop the intuition. As one becomes more influenced by the light of the Soul, less and less personality reaction is demonstrated, until ultimately emotional reaction is superseded by the life of true and inclusive love indicative of soul control. There are no bright stars in the constellation Cancer, so befitting a sign of retreat and hiding. At the very center lies a cluster of stars modern astronomers call the Beehive, perhaps representing the mass consciousness of humanity, the collective mind. In the mythology of the Cancer Labor of Hercules, the legend has Hercules chasing after the doe claimed both by Diana, the huntress of the heavens, and Artemis, goddess of the moon. After searching for a lifetime, he finally brought the deer before the gods to discover it belonged to another yet. The doe was not Dianas (the intellect), nor Artemiss (the instinct), but was claimed by the sun god Apollo as the brilliant shining light of the intuition. The intellect, born out of instinct, is a means to develop this higher quality, the intuitive vision of the Soul. For this is a sign of fusion, in this case the fusion of the physical body and the Soul. The different stages of this fusion are reflected, for undeveloped humanity, in the individual unit as blind; in advanced humanity, as the individual awakens to the energies flowing all around them; and in the initiate, we find the awareness of the Whole, seen as one. The keynote of Cancer is "I Build a Lighted House and therein Dwell." Again, transcending the watery instinctual nature to be replaced by the ever increasing light of the Soul is the evolutionary goal for this sign. To break free of the protective limitation of the Crabs shell and to become the radiant, outpouring source of love and light and service is truly the highest calling for Cancer natives. And as the magnetic energies of Cancer focus and draw in all souls on their incarnational process, so too does the polar opposite of Capricorn draw in all souls on their way towards relinquishing the cycle of rebirth and through the process of initiation, ending the need to take form to evolve. To this sacred duty, Cancer plays its role. 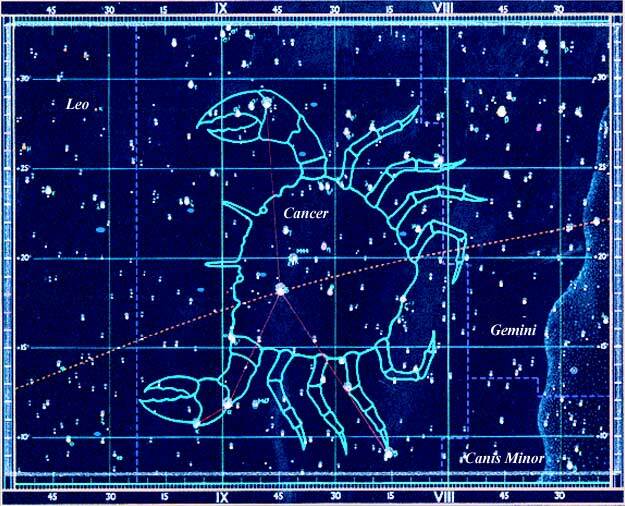 It is interesting to note that during the time we say the Sun is in Leo, each year from July 22 to August 21, due to the precession of the equinoxes, and from the Earth's perspective, the Sun is actually traversing the zodiacal sign Cancer. With this consideration, we invite you to review the SouledOut.org materials on Cancer freshly, from this perspective.